Posted on 1, February 2019 by EuropaWire PR Editors | This entry was posted in Agriculture, Environment, Germany, Industrial, News and tagged agriculture, beech, beech firewood, coniferous trees, coniferous wood, Destatis, forestry, forests, hardwood, industrial wood, larch trees, logging products, oak, pine trees, softwood, trees, Wood, wood cutting, wood skidding. Bookmark the permalink. WIESBADEN, 1-Feb-2019 — /EuropaWire/ — 53.5 million cubic meters of wood were logged in Germany during 2017 as reported by the Federal Statistical Office (Destatis). 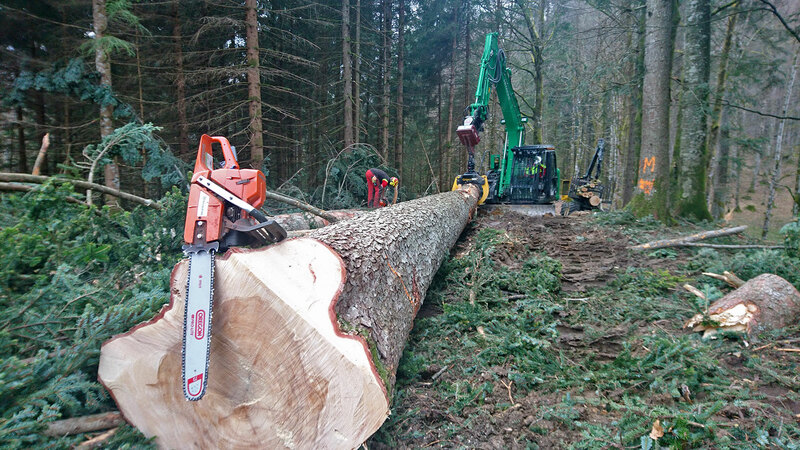 Around three quarters of the logging that took place in Germany during 2017 came from coniferous trees. Pine and larch trees accounted for 12.0 million cubic meters while spruce, fir, Douglas fir and other coniferous wood were the largest number with 28.9 million cubic meters, accounting for more than half of the total logging. The logging of hardwood was 12.6 million cubic meters and thus almost a quarter of the total while 1.9 million cubic meters of oak and red oak were logged. Beech and other hardwood accounted for 10.6 million cubic meters during the same year. The prices of raw wood from state forests (excluding VAT) in November 2018 were 7.4% lower than in November 2017. Prices have been below the level of the respective month of the previous year since June 2018. In the case of logs and trunk sections, the price decline in November 2018 was particularly strong at -10.9% as compared to November 2017. In the case of industrial wood, prices rose by 2.9% over the same period and even by 9.4% for beech firewood. Wood products for energy production increased by 3.6% between November 2017 and November 2018. In the medium term, the prices of raw wood since February 2015 are declining. Only during one period in particular, from September 2017 to May 2018, prices were slightly above the previous year’s level. In November 2018, compared to February 2015, the price of raw wood was 14.7% lower. This development is attributable to a significant fall in the price of logs and logs in coniferous trees (spruce: -20.6%, pine: -11.7%). In the case of deciduous trees, prices rose over the same period (oak + 12.6%, beech + 8.8%). Due to the lower importance of these tree species, however, these increases in the price of raw wood from the state forests, as a whole, have hardly been felt on the market.